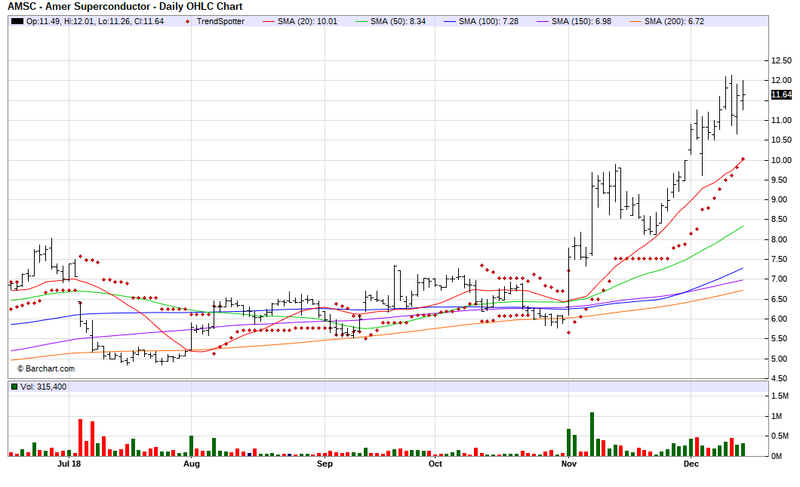 The Barchart Chart of the Day belongs to the energy technology company American Superconductor (AMSC). I found the stock by sorting Barchart's Top Stocks to Own list first by the most frequent number of new highs in the last month, then I used the Flipchart feature to review the charts for consistent price appreciation. Since the Trend Spotter signaled a buy on 11/02 the stock gained 48.25%. American Superconductor Corporation is a leading energy technologies company. The company develops and sells a wide range of products and solutions based on power electronic systems and high temperature superconductor wires that dramatically improve the efficiency, reliability and quality of electricity during its generation, transmission, distribution and use. The company is a dominant force in alternative energy, offering grid interconnection solutions as well as licensed wind energy designs and electrical systems. As the world's principal supplier of HTS wire, AMSC is enabling a new generation of compact, high-power electrical products, including power cables, grid-level surge protectors, motors, generators, and advanced transportation and defense systems. AMSC also provides utility and industrial customers worldwide with voltage regulation systems that dramatically enhance power grid capacity, reliability and security, as well as industrial productivity.